Prometheus, shepherd moon of Saturn’s F ring, is featured in this dramatic image from Cassini taken as it passed by at a distance of 23,000 miles (37,014 km) on January 27, 2010. This is the closest Cassini has come to Prometheus. The image above has been extensively cleaned up in regard to CCD pixel noise and cosmic ray hits, which become more pronounced the longer the exposures are. One interesting thing to note is along Prometheus’ upper left lobe the thin shadows cast by Saturn’s F ring can be seen. 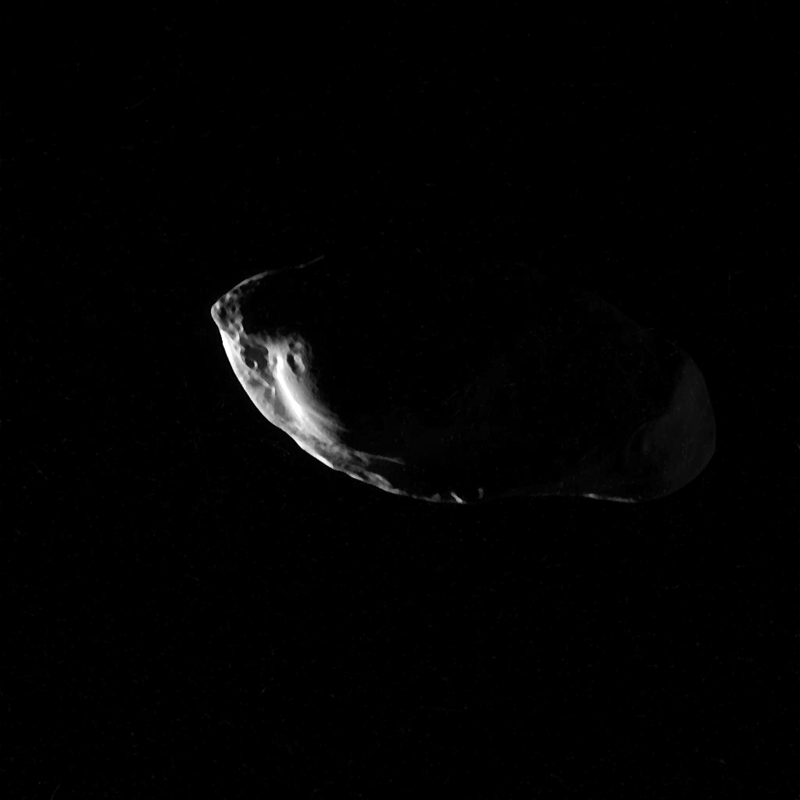 ADDED: Here’s another view of Prometheus, this time I tried to clean up the artifacts in the raw file a bit. The full irregular shape of the moon can be seen here. The potato-shaped Prometheus is about 92 miles at its longest and 42 miles wide (148 x 67 km). More great images from the January 27th flyby of Prometheus – including one in color – and also some of the recently discovered moon Aegaeon can be found on The Planetary Society’s blog here. Also, and I could be wrong, but it looks like the shadows of the F ring’s ropy structure are being cast onto the upper left of Prometheus. This really is a fantastic view of the moon! You’re right, those are shadows of the F ring strands. If you flip through adjacent frames you can see them move across the moon. I know now, I saw Emily’s color-calibrated version of the image. This is really one of Cassini’s recent bests!